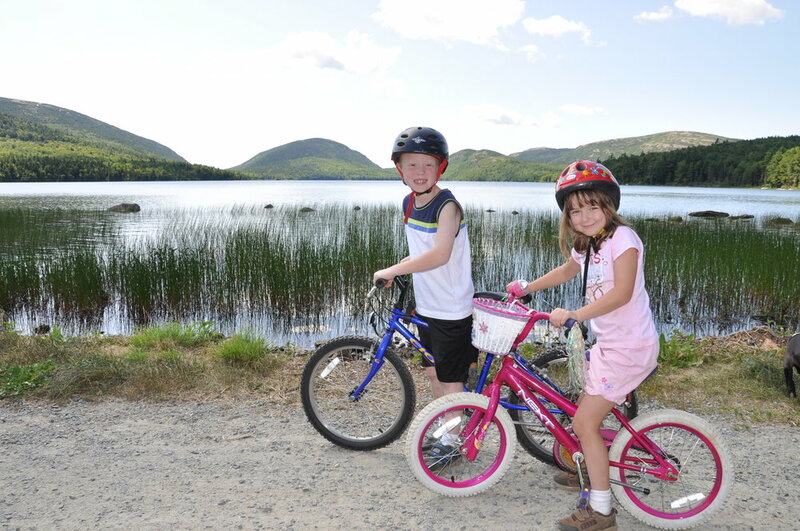 Ride Acadia National Park's carriage roads without the nuisance of motorized vehicles! We have a large selection of 27-speed mountain and hybrid bikes in all sizes, plus a wide variety of accessories, including child seats, trailers and tagalongs. Our friendly staff will make sure you are fitted with the perfect bike for a great day on the carriage roads. We’ll also provide maps and advice on the best routes to take! The carriage roads of Acadia National Park provide the perfect venue for biking. Built by John D. Rockefeller, Jr. and recently refurbished to tip-top shape, the carriage roads are closed to all motorized traffic. They’re made of hard-packed gravel, which is perfect for both our mountain bikes and our hybrids. The free Bicycle Express shuttle, part of Acadia's Island Explorer system, departs from the Bar Harbor village green, just a few blocks from our shop. It will give you and your bikes a free ride to and from the carriage roads of Acadia. The shuttle operates from June 23 until Sept. 30. Call 207-288-8118 to make reservations now!